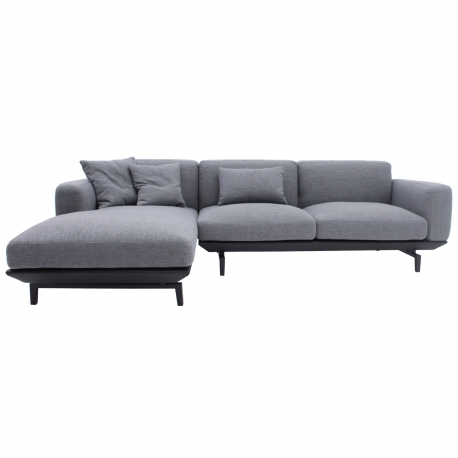 LI-LI three seater corner sofa, as shown, dark-blue-grey woven fabric with a left arm facing chaise and includes three cushions. The black powder coated metal feet lift the sofa off the ground contrasted with the seat cushion height, generates an interesting visual perception of LI-LI as a low elevated sofa. This effect makes it particularly elegant and chic. The product is also available in blue-grey or can be customised into other fabric, leather or colour and a two or three seater sofa. For more details, please contact us or visit our showroom.